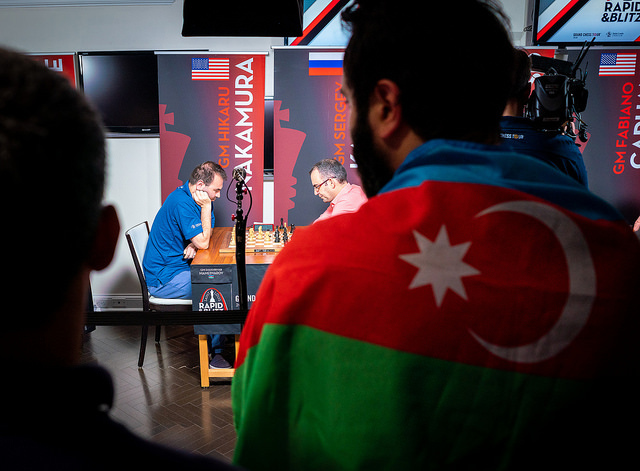 Shakhriyar Mamedyarov banged the table in frustration after a blunder in a winning position gifted Hikaru Nakamura a win that meant the players go into the final day of blitz still locked together in first place. Fabiano Caruana also remained in third, since Maxime Vachier-Lagrave had started so far back that even a brilliant 7/9 3000+ performance could only cut the gap to the leaders to two points. It should be noted that although 46…Re1+! is indeed winning, it’s not trivial in this case. After 47.Rxe1 Qxd5 White gets to queen with 48.c8=Q, and after 48…Qxd6 the reason Black is winning is his pair of unstoppable queenside passed pawns. I’m tied for the lead on a day when I feel I didn’t play my best chess, so that’s the best you can ask for. 32.f5? converted a stable advantage into a mess where Black soon won a pawn and went on to win. 20.Nxd5! and Black resigned, since he’s losing a lot more than a pawn due to the weakness of the black king, with the white knight and queen both eyeing f6. 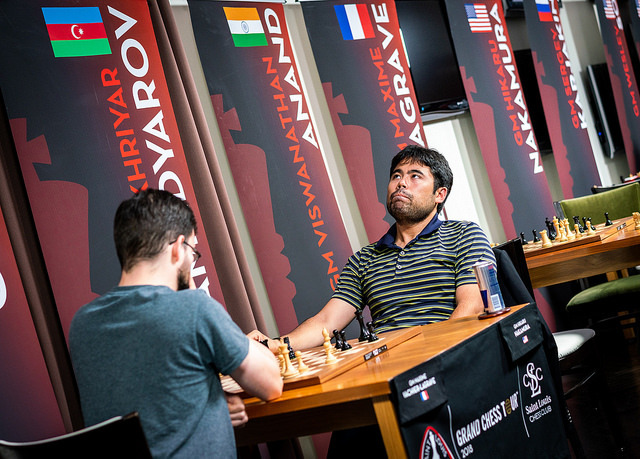 Once again, Mamedyarov and Nakamura were tied for first. I felt from the very start that my hands were doing the right moves, and that helps! He played 17…0-0? !, a move “for which I should probably be banned from chess… I castled into a four-piece attack against zero”. He went on to win that game, though, and his only problem with the day was that a sequence of three losses in a row on the final day of rapid chess had left him a full four points behind the leaders. 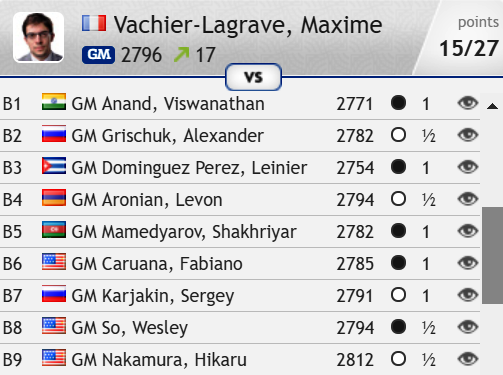 He’s now cut that to two points, but if either Nakamura or Mamedyarov has a good final day Maxime will need another out-of-this-world performance to fight for first place. 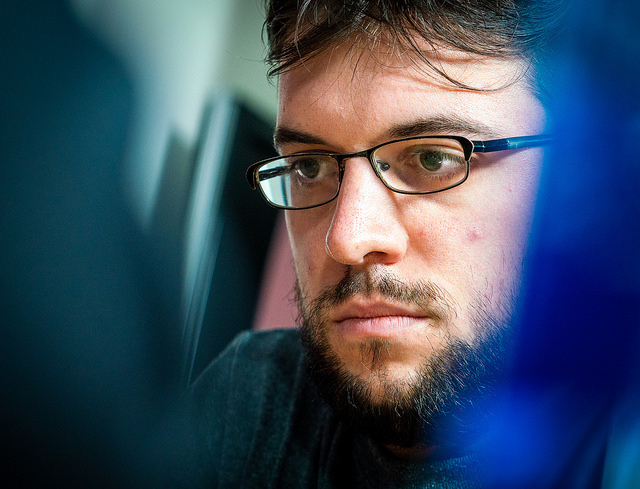 He would go on to lose three games in four in the middle of the tournament, but he ended with two wins to score 50% for the day and remain in third place, 1.5 points off the leaders. That’s right, for one move only Nakamura had the chance to pick up a free knight with 67…Qxf5+, when the game should end in a draw. Instead after 67…Qc7+?? 68.Nfd6 normal service was resumed and Nakamura resigned three moves later. 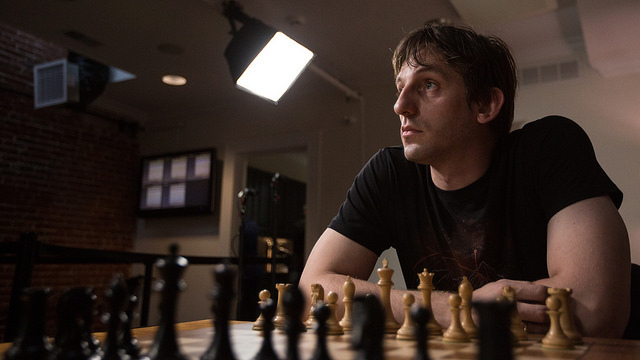 Alexander Grischuk is a 3-time World Blitz Champion and a player who believes in speed chess so much that, unlike all his colleagues, he’s said he’s sometimes more willing to use a novelty in a rapid event than in a classical tournament. 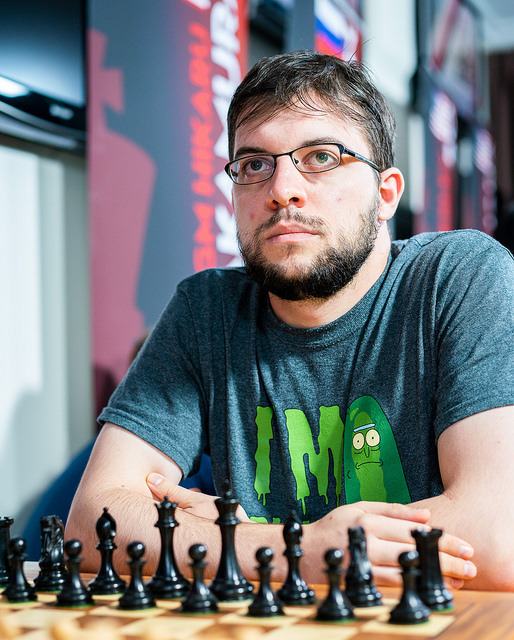 It’s a shock, therefore, that he managed to go 15 rapid and blitz games in St. Louis without picking up a single win. That 15th game was almost comical, as he was facing Vishy Anand, who hadn’t won since Round 1 – a movable object meets a stoppable force. It’s pure chess geometry why Grischuk's rook can no longer stop the g-pawn. Of course the knight directly covers d5 and d1, but it also covers d6 (a Nb5+ fork) and d2 (a Nb1+ fork). Alas, Fabi didn’t manage to make the move 49...Nc3! in time. He explained that he'd seen it quickly, but, “subconsciously I wanted to check all his moves”. Sometimes good habits can be fatal! That was the one win in a row Grischuk needed, and although at one stage in the next game he was worse against Dominguez he eventually went on to win a game featuring an equally beautiful final position – just look at that rook! 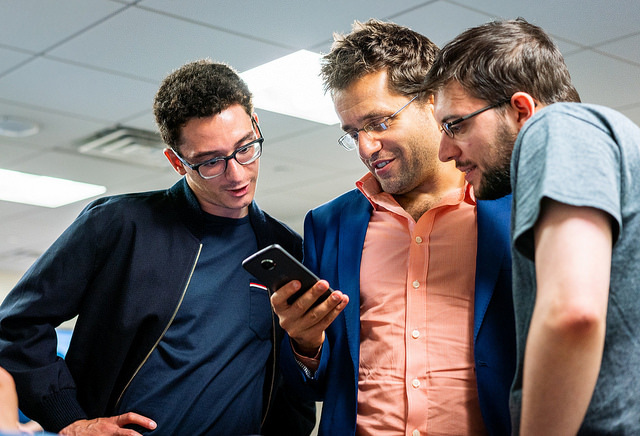 He saved the best for last by outplaying and beating Aronian, who had gone into that game on an 11-game unbeaten streak. Grischuk’s revival won’t be troubling the leaders, but at least it allowed him to climb to the dizzy heights of 8th place. 50...Rh4+ was a blow from which he never recovered, going on to lose the last three games as well. The final one summed up his day, as he lost on time in a drawn position. 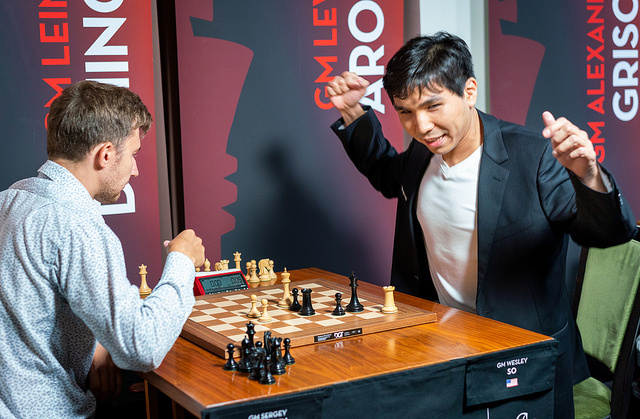 Wesley So was the beneficiary, but that was the only win of the day for the Grand Chess Tour leader, who is soon to lose that status. 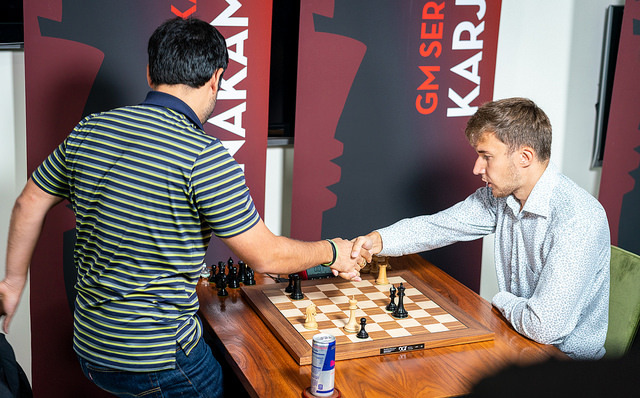 He started the day with losses to his US teammates Caruana and Nakamura and then also went on to lose to Dominguez and Mamedyarov to drop to second last place. The players agreed afterwards that 9 rounds of blitz are far more emotionally-draining than one classical game or three rounds of rapid chess, but now they have to do it all over again. Get the popcorn ready, since the St. Louis Rapid and Blitz must end on Wednesday. Tune into the live action here on chess24 from 13:00 local time (20:00 CEST)!